After a long delay, here’s the review of the load-hauling beast: the Hammertruck by RANS. A few items to discuss before we delve into this thing — RANS sent me the bike at the end of January…about two days after I got it I had surgery and was unable to ride it (or any bike) for a month. 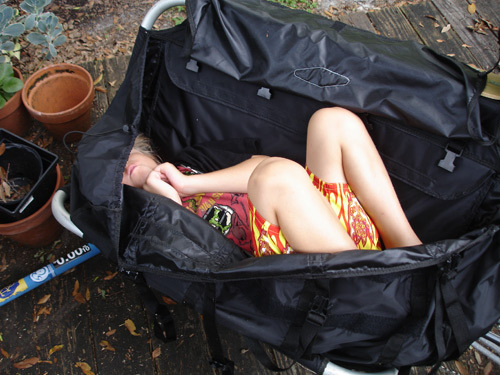 Then the demands of having a new child kicked in…he’s not ready to travel by bike, so I really had to squeeze in “special trips” by myself on this machine — grocery runs, trips to the post office and other errands one would typically use a cargo bike for. I also found out the hard way that for my purposes, this bike isn’t suited to my daily commute. I rode it to work on the first day I was able to ride and discovered to my dismay that the Hammertruck wouldn’t fit through the door to my building! Seein’ as how there was no way I would lock a $2000 bike — especially one that doesn’t belong to me — outside my building in a fairly high-bike-theft area, I raced home and swapped out bikes for something a little more svelte. Word to the wise; with the cargo platforms deployed, this bike is WIDE. 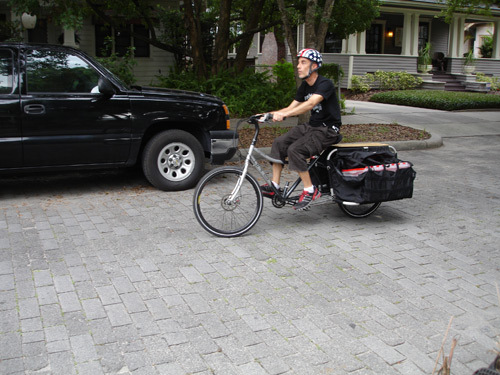 One other point: throughout the testing period and in this review, there will be inevitable comparisons of the Hammertruck to the U.S. cargobike-industry-leading Xtracycle. I own an Xtra and have ridden a few thousand miles on mine…and can’t help but compare/contrast the two bikes in many respects. The first thing you might notice is the radical layout of this bike…it uses RANS’s “Crank Forward” positioning to allow for a lower center-of-gravity and the ability for the rider to place both feet on the ground easily when stopped. There is a whole host of benefits claimed by RANS at their site describing the Crank Forward technology. 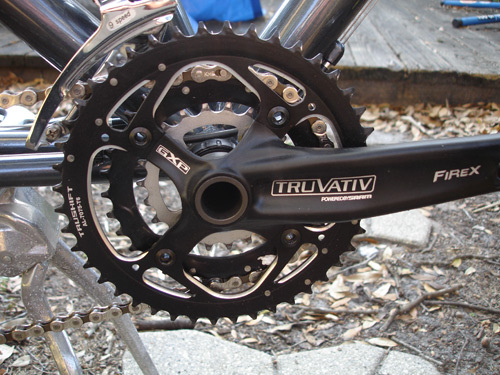 The parts spec on the Hammertruck was quite satisfactory — drivetrain parts consisted of a Truvativ Firex triple crank with outboard GXP bearing cups, SRAM X-7 derailleurs coupled to a 9-speed twist shifter, wide range SRAM (11-32) cassette and a really really long chain. More about that chain in a bit… Because the frame is set up in such a distinctive way — with the seat tube really slack — a “stub seat tube” or boom-tube was added to hold the front derailleur. 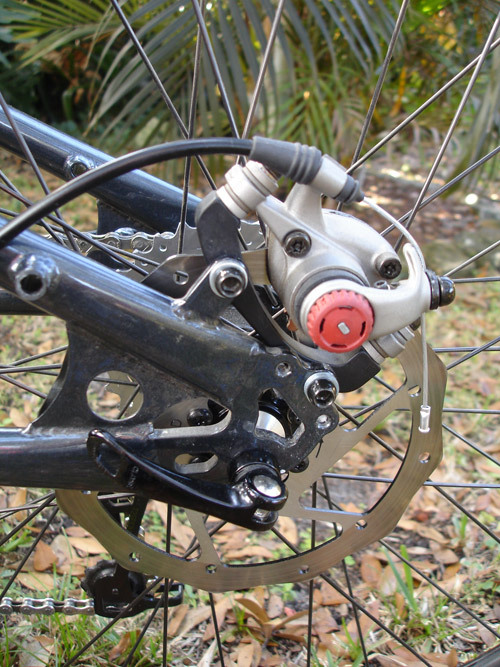 It looks weird but it is required to get the derailleur into the proper orientation. Braking was very capably handled by Avid BB7 discs with 160mm rotors front and rear and some of my favorite flatbar levers, the Speed Dial 7. My favorite part of the components was the wheelset, though — 26″ Velocity Cliffhanger rims laced to Velocity cartridge bearing disc hubs and wrapped in Primo Comet tires. The wheelset was strong and smooth and I really fell in love with the tires. I wasn’t familiar with Primo tires, but soon discovered their popularity in high-performance recumbent circles…they are capable of running at high pressure (110 psi) and the file tread is fast-rolling on most hard surfaces. About the only thing I’d change parts-wise on the Hammertruck is that I’d swap out the 160mm rotor for a 203mm rotor on the rear (with the appropriate spacer adapter) — extra braking power is a good thing when you’re hauling 200 lbs. of cargo. Is it needed? Maybe not. I’m just partial to this setup because my Xtra is set up that way, and I’ve come to appreciate that massive stopping power, even with the lesser brakes on my personal machine. The saddle was something out of the recumbent playbook — a fairly massive “tractor seat” — and I wasn’t sure how, exactly, to set it up. 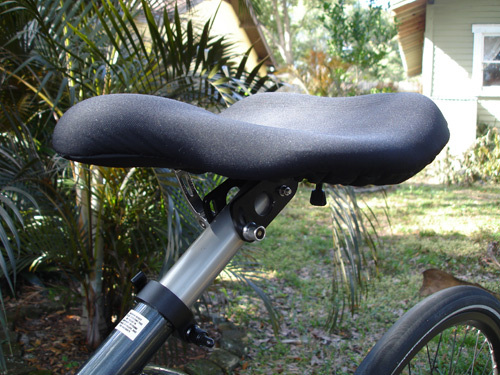 On the RANS website, there are several photos of riders sort of leaning the backs of their butts against a downward-tilted saddle…there’s a quick-release under the saddle to allow for tilt. Well, I tried that and it just felt alien, so I set it up as I would a normal saddle and had no issues. That tractor seat is pretty comfy for long rides, too. That handlebar is way up in the sky, and the bars have an incredible backsweep to allow for easy reaching. The whole assembly is very chopper-like: hands in the air, the rest of the body kicked way back. To be perfectly frank, it felt a bit weird; overcoming 30+ years of muscle memory on more traditional bikes is not an easy task. And, with so much weight biased toward the rear, the slack headtube angle, and the front wheel seeming so very far away, slow-speed maneuvering was for me rather squirrely, especially with a heavy cargo load on board. Once any amount of speed was gained, the entire platform was rock solid and smooth, with effortless directional changes possible. Something to think about, in any case. The Hammertruck is rated for 525 lbs. of rider and cargo…and with the bags and generously-sized runners, there is very little that one couldn’t haul aboard this machine. 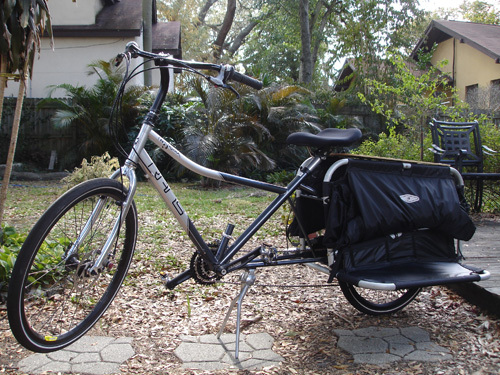 To put it in car terms, an Xtracycle is like an old Datsun pickup — good for hauling but not too easy to load really big items. The Hammertruck, on the other hand, is like a Ford F-250…tailor-made to haul a serious and soul-crushing load of whatever you might want to throw in there. One could easily get carried away loading this badboy; I never got much past 200 lbs, but I was tempted and had room to spare when I did “go big”. Did I mention that the bags are giant? Earlier on I mentioned the long length of chain that runs this drivetrain. 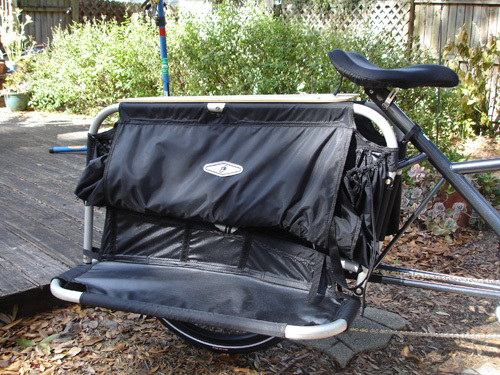 While the wheelbase of the Hammertruck is very similar to an Xtracycle (depending, of course, on the parent bike the Xtra is built upon), the “chainbase” is quite different. Throw in that “crank forward” setup and I’ve got a chainbase of 38″ unsupported inches as opposed to 32″ on my Xtra. The rear derailleur on the Hammertruck just doesn’t have enough spring tension to manage this much chain (nor does ANY derailleur that I can think of), and I was plagued by a persistent and annoying chain skip in all gears. I could have tried to shorten the chain by a few links, but that could compromise the shifting range and I didn’t want to do that — hauling hundreds of pounds of cargo means you’ll need the full range. I’m not sure that would have worked to eliminate the skipping anyway. 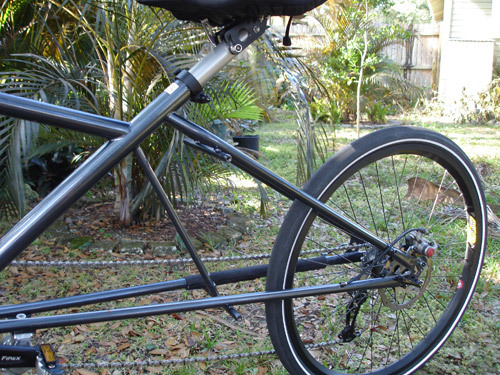 I noticed that RANS sells idler pulley kits for many of their other bikes, and while I didn’t see one specifically for the Hammertruck, I remember stumbling across a description of an idler setup for this bike. If you go the Hammertruck route, talk to RANS about an idler. You’ll be glad you did. 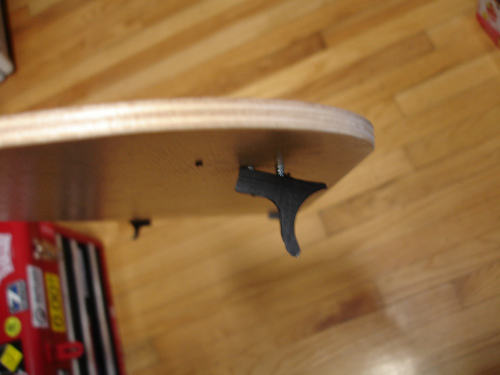 RANS included a very nice double-legged Pletscher kickstand with the Hammertruck. This is a $100 option when ordering one. Word to the wise: skip it. 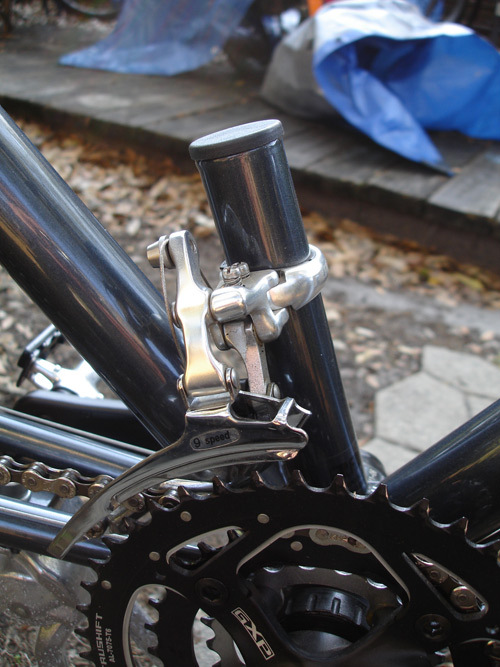 On a traditional bike, the Pletscher stand is a dream; on the Hammertruck, it’s about useless. There’s so much weight on the back of the bike, and coupled with the wide stance of the runners and wind-catching cargo bags, tiny gusts were sufficient to tip the bike right over. RANS recommends leaning the Hammertruck on one of the runners when loading, and that serves admirably enough for a kickstand. Perhaps a wide-legged double stand like the Rolling Jackass centerstand would be more suitable? Until there is a better attachment method, I can’t recommend hauling anything heavy or precious aboard the deck of the Hammertruck. 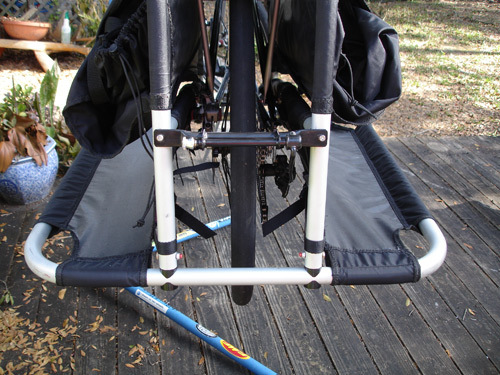 Also, since the seatpost is fairly hidden by its slope and by the rest of the cargo rack assembly, auxiliary devices like passenger handlebars (commonly seen on Xtracycle conversions) will take some ingenuity to install aboard this bike. Overall, the Hammertruck was a joy to ride; comfortable, stable and capable of some amazing load-hauling prowess. I did have some minor issues (the aforementioned chain-skipping problem, the bit of squirrelyness at initial push-off), but none would be considered a deal breaker. I was really surprised at how stiff the frame was under load; I’ve long taken it for granted that sway was the nature of the beast after riding my Xtra for so many miles, but RANS did their homework and applied bracing in all the right places to eliminate that sway. I wouldn’t balk at the price, either…for around $2K, this is truly a car replacement as it can haul just about anything you might need a motor vehicle for (short of a camper trailer or big fishing boat). The parts spec is certainly worthy of a $2000 machine, and the cargo bags alone are really capable. 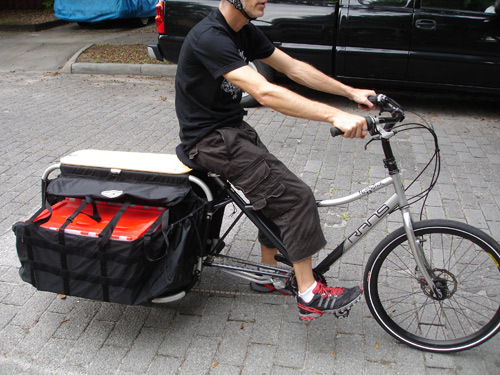 Add the RANS Hammertruck to the growing list of valid cargo bikes options! To learn more about the RANS Hammertruck, visit the RANS website by clicking here. Very cool, been looking forward to a review of this bike for awhile. Any review. And yours is quite good. Looks like its going up against the Kona Ute or Yuba Mundo for cargo load. I’ve had a similar setup to this for two years already. I took a RANS Street and added the Xtra to it. Ended up with my XtraStreet. Its even longer than the Hammertruck. It does fine for all the loads I need, but does have some noticeable sway to it when loaded heavy. But I’m much happier with the looks of my bike than the Hammertruck. I think they should have stretched the cargo racks back for just a bit more room behind the seat. I’ve since changed to some swept back bars. 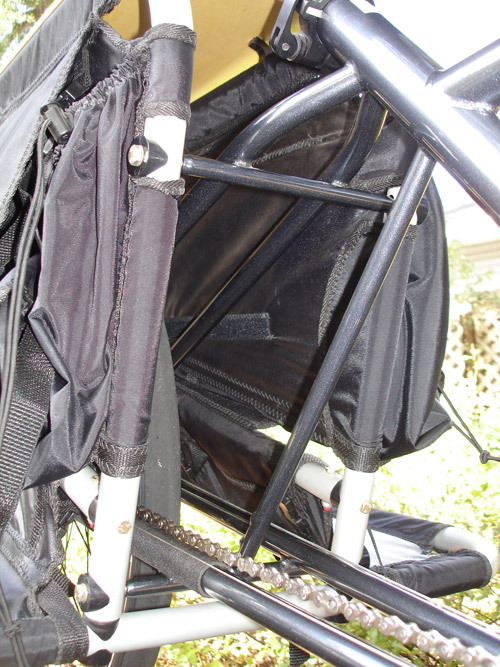 The chain tubes I brought over from my recumbent experience, works great to deal with the extra chain length, and keeps the sway down (along with keeping the chain cleaner). So far, no one has requested a Rolling Jackass stand for a Hammertruck, but it will be easy to do when it is needed. The only issue should be the need for a tandem cable to reach the handlebars; otherwise, adapting for this frame is no problem at all. I am intrigued by the “Crank Forward” style. It certainly looks suited for heavy riding and slow cadences. One question has bugged me since you first showed us photos of the bike – can you stand up on in for that short extra burst over the rise? Is it possible with the cranks forward and the swept back handlebars, and if so does it help any? @Zyzzyx — holy cow, that’s a l-o-n-g machine! Very nice look. @Val — glad to hear it. Mostly I like to include the words “Rolling Jackass” in any bike review I write — because I know you’ll catch it and also because that’s the best product name in…well…forever! @Martin — yes, out-of-the-saddle digs are possible with a crank forward bike. It feels weird, no doubt (you’re right up against the stem on this bike…somewhat surrounded by the handlebars), but it provides the same benefit that it does on a traditional bike. I’ve been riding a Hammer Truck for the past year, and I have a hard time going back to a regular bike. I especially love the amount of pedal pressure I can generate without standing, the lack of pressure on my hands and shoulders, the comfortable seat, and the way I can put my feet flat on the ground while seated without tipping the bike (especially helpful when I have a kid or two on board). It’s a really practical design for me. I have a blog and videos about my experiences at http://MyCargoBike.net. My focus has been on electric cargo bikes like the Kona Electric Ute, Yuba elMundo, the coming Transport+ from Trek, and my own BionX-powered bike. Each has its own strengths and weaknesses, but the crankforward design of the Rans bike sets it apart. Unfortunately, Rans does not offer an electric motor option, so you have to add it after-market. My blog describes some of the pros and cons of the BionX motor in that regard. Thanks for the well-written and unbiased review! I purchased this bike in part due to your review. After putting on quite a few miles in a short amount of time, I have some observations. The bike should be able to fit through any door opening and made much less wide by removing the lower runners/cargo platforms. They are held in place by pressure and a spring-loaded steel ball located on each end and can be removed in less than a minute. I haven’t experienced the chain-skip yet, but it is possible that since my bike was a demo model, that issue was resolved. Like you, I found the seat tilting forward alien, so I returned it to a fairly horizontal position. 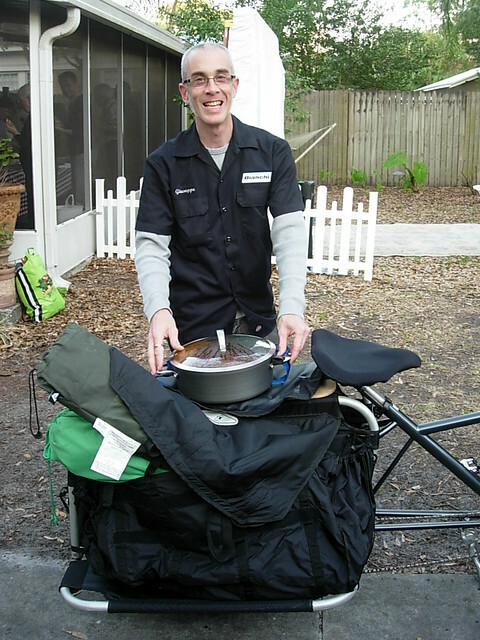 Low speed handling for me was fine, but likely because I have been riding recumbents for years. 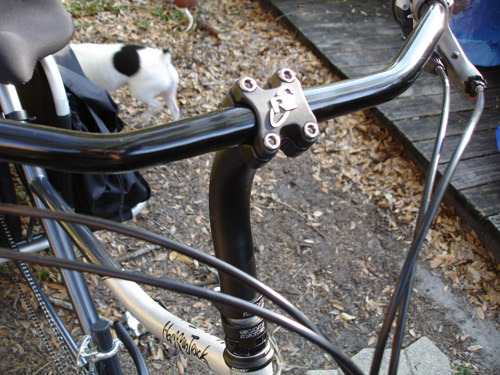 Adding passenger handlebars is easy since they are a stock item taken from the Rans crank-forward tandem. I know that the cargo platforms are removable, but on my test rig they needed much coaxing on and off with a rubber mallet…and I did not have one on me when I got to work. While your chain didn’t skip, I’d still advise to get an idler setup — that’s a really long stretch of unsupported chain.